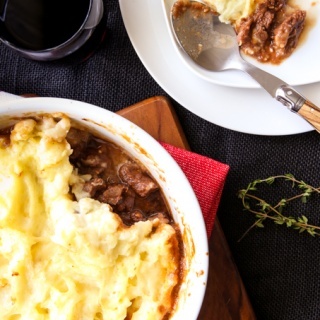 With Fathers Day coming up this weekend in Australia, I asked the Skinnymixers Community what they would like to see for a special Fathers Day Thermomix recipe… So many people said “something with beer” and quite a few people suggested a Beef & Guinness Pie recipe. Put onion and garlic into mixer bowl, chop for 3 sec/speed 9/MC on. Scrape bowl down. Add remaining ingredients and cook for 40 min/steaming temperature/slowest speed/MC off. Put the simmering basket over the hole to avoid making a mess of your kitchen. 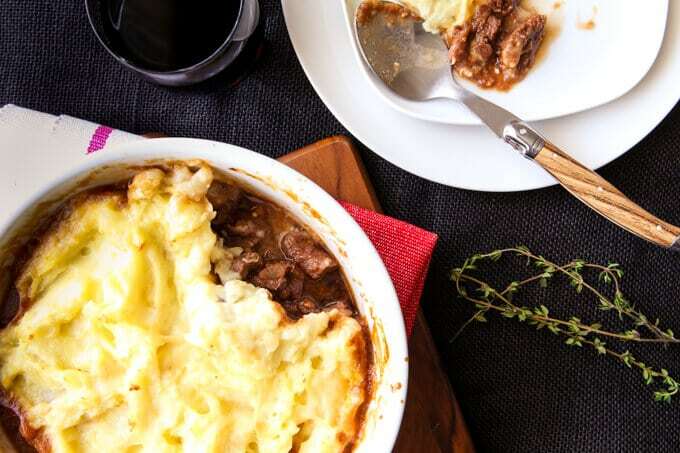 You may need a little more time depending on your thermal cooker - because beef tends to have different water content levels, watch this recipe closely towards the end to avoid the meat disintegrating or drying out. Note: if your pie filling is too watery, remove your meat now and cook the liquid down for a further 5-10 min/steaming temperature/speed 1/MC off or until reduced. Note: let the dish sit for 10-20 mins after baking in the oven for the mixture to thicken and settle. At step 1 add on 1-3 seconds if onion requires further chopping. At step 3 use speed 1 and ST temp if using an Intelli and speed 1 and 120°C or 250°F if using a Supercook. If using step 4 use ST temp with an Intelli and 120°C or 250°F if using a Supercook. Could you make this with mince?? Hi! I’m looking forward to making this for my family tonight. On what oven temperature and for how long? I can’t see it in the recipe. 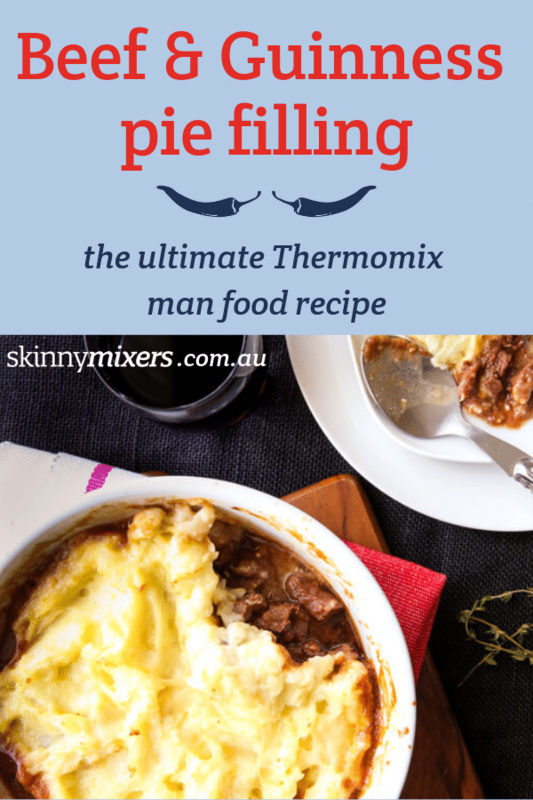 The best pie filling I have made with the Thermomix. Filling was so delicious and so much flavour. Thanks Nik for sharing your recipes – you inspire people to cook great wholesome meals. Delicious! It was a hit with the whole family. Will make a bigger batch next time in the slow cooker and freeze some for hubby to take for work. My husband says this was bloody beautiful! We substituted red wine for the Guiness. Thank you Nik. Absolutely phenomenal!!!! This will be a regular in our house for sure. Love it, thanks Nik!!! Used red wine instead of Guiness. Absolutely sensational, thank you! With the world most picky family i was so excited that EVERYONE loved this filling. Fed 8 people and not a single complaint. Simply made them into pies and they were devine. Oh my goodness. Another amazing meal. This will soon be a regular in our house no doubt. Has any one done this in the slow cooker ?? Double batch?? So good! Will be making it again… Very very soon! I ate so much before it eventually made it into the pastry. Another delicious recipe! I put the filling into pie pastry and served with a side of your silky sweet potato mash – yum! Making it again tonight for my in-laws. Thanks Nik! Thank you so much for another delicious recipe!!! this Was devoured in minutes last night. Even miss 2, scoffed the meat down. Thank you nikalene! Another super easy super tasty recipe. YUMMO!!!! Made this and served the filling over mashed potato that i put cooked diced bacon through!! AMAZING. Will try in a pie next time too. And it tasted fantastic too…..
OMG! Hubby just made this for dinner and it has been demolished! I could smell it cooking 100’s of metres away while when walking home through the bush with my puppy. Definitely going to be a favorite in this house! With 2 and 3 year old girls asking for 2nds and 3rds! We made two batches, the first for Father’s Day Lunch. The second we made into pies in the pie maker and popped into the freezer for anytime snacks. This recipe is so easy to make and the flavours beautiful. Thank you Nik for another wonderful recipe. We made this for Fathers Day dinner and it was delicious! Cooked in the Bellini Supercook – it needed an extra 10mins to be done and used the blunt blade. Hubby is on LCHF so we served as is with some steam veg instead of making it into a pie – so good! This will be our new go-to pie filling 🙂 thanks Nik for another winner! Substituted guiness for beer hubby cant stand guiness, he loved it, said he might try it with guiness next time. Another winner. This recipe was easy, tasty, tender! This isn’t something I’d go for normally but hubby was keen. Well it was delicious and will be made again I’m sure!! Thanks this is tasty!! This was absolutely amazing. Hubby and I loved it. On the TM31 it’s the spoon symbol…not sure with new one. Do u think I could leave the Guinness out? Excuse ignorance 🙂 do we need to cook on reverse? Or doesn’t the meat break down as it’s cooked on slowest speed? Perfect flavoursome beef filling, absolutely nailed it! I made this today for lunch and was planning on having the leftovers for tea! I had to make another batch for dinner because hubby and the 2 kids demolished it at lunchtime. I asked them what they wanted for dinner and they said ‘the same as what we had for lunch please’. Nik, you have nailed it again!! We just returned from a trip to Ireland , and this will be perfect for me to make whilst having another pint! Woohoo! I’m teaching my Irish other half how to use the “Termi” – this will definately be a motivating recipe for him! Thanks Nik! My Dad isn’t around for Father’s Day, but my Irish mother is going to love this 😀 thanks again Nik!